Home » Blog » For Sellers » Is the Property Survey Accurate? When we (sellers of real estate) take a listing from a seller, we review the property with the seller. She shows us the property and we review the plano. We ask where the boundary lines to the property are and the seller will generally indicate the line in a diverse number of ways. Sometimes there are convenient line definitions: a road, a creek, a natural drainage ditch, ridge-line etc… But frequently the line is “over there”, stated with a wave of the hand, and gesturing towards a mass of overgrown jungle. When a prospective buyer enters into contract with a seller, there is typically a 1 month term of due-diligence. It is during this time that the buyer’s agent and attorney will oversee any concerns about the property. These “concerns” are to make sure that the property has legal water, electric, access and, that the seller has the right to sell the property, that the property is indeed what was represented to the buyer AND, that the survey is accurate to within 5% of the size represented to the buyer. It is this latter point this article addresses. In the due-diligence period, it is recommended that the buyer, at their expense and arranged by the agent, hire a topographer to re-measure the property. This is called “re-planteo” here in Costa Rica. Some property owners maintain their property lines and so they are easily found. This is the exception and not the rule. When the original survey work is done, most topographers will place steel or cement posts at critical points along the boundary line that correspond to points indicated on the plano. As stated, maintained property lines are not common. These lines frequently have become inaccessible due to jungle encroachment and the posts, if they are still there, are covered by vines, moss and lord-knows what manner of life, resulting in an appearance very much like their surrounding environs. In a word, they become invisible or certainly, difficult to locate. Over the years, I have worked primarily in the mountains above Uvita. I have been shown the properties there by various sellers and followed procedure regarding where the property lines are/were. Again, this is a matter of asking the seller, and the seller indicating in one of the aforementioned manners where the lines are. Bear with me, we are now getting to the “deficiency” mentioned. My conception of the 3 properties and their overlap. the pool is in construction, being made with cinder block and lots of digging. That property owner is committed to it being there both in monetary investment as well as overall quality of the property. The error of where I had represented the line, years ago, and where it is being suggested by the topographer’s re-planteo to actually be, could cost the middle property owners a lot. In fact, it would seriously de-value his property and result in having to re-design things at a tremendous expense. The area that he would lose is the view area and also, is where his pool is. How did this happen? I had represented to the various property owners, as well as the current buyer, where the lines were. In this case, the line was at a ridge. In my presentation of the properties I indicated the ridge line and stated “that is the property line”. 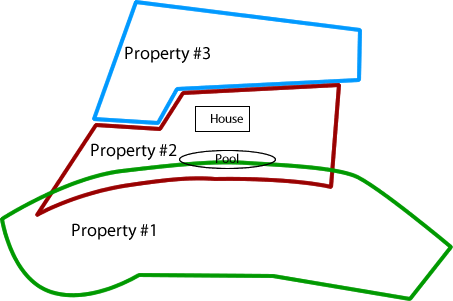 This was based on the loose procedure that is used when we (us realtors and our sellers) discuss where the property lines are. Now that the topographer is doing the legal defining of the lines, we find out that it is not the ridge line but instead, is several meters beyond the ridge line. The solution to this particular problem is currently in progress. We are getting a second opinion and may find that the topographer was simply wrong. The solution to the deficiency in our industry is another story. When us real estate agents take a listing, we are not in the practice of hiring a topographer to verify where the lines are. This procedure runs in the hundreds of dollars per property. This would make working in the profession of real estate in Costa Rica cost prohibitive in many cases. At first I thought that there had been an inaccuracy of the plano. One such glitch and the entire jug-saw puzzle of neighboring properties gets thrown into chaos. I imagined having to go around to the various property owners and explain how they will need to do a re-measuring of their property to see find how it effects them. Then, when I realized that the plano was accurate and that the problem was in the presentation of the property – by me – based on what I was told by the seller(s), I started to think about the procedure we use in taking listings and found the deficiency. We simply don’t verify with a topographer that what the seller tells us is accurate. So, what do we do? I’ve decided for my part that when I take a listing, I’m not going to go through the expense of hiring a topographer, but instead, am going to ask the seller to clearly define the property lines. Find and uncover the posts that were used. If they aren’t there, get them put there, and then keep the lines maintained. This isn’t the end-all solution. They seller may be mistaken or there could be an inaccuracy in the existing plano. But it will clearly establish that all representations of the property have been done in good faith.